Anyway, this post is something that I always wanna share but again is hard to find the right time to do it, no spare time. But then, thanks Lord I have time and it's now! The trick is you should wear wedges or high heels and it must have a minimum height 7cm. Now for you who love Ulzzang, the picture above is for your inspiration. 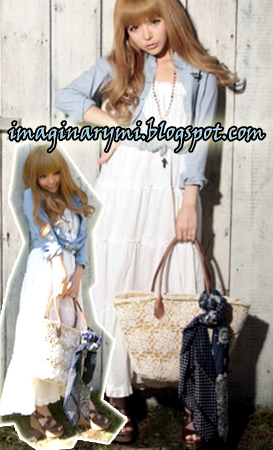 The picture is from Pinkage , one of Ulzzang Girl online shop in Korea. Well, Korean girls are taller than Japanese girl, as long as I know. So, they don't have to wear any heels. So, which one do you like the most? Me the first Tsubasa Masuwaka picture. Please visit Baju24.com to get some cute Maxi Dress in super cheap price and they customer service is super nice too!! Btw, I just got my package from them yesterday, I ordered a legging, promise to make a review bout it!